Teleporters - Star Trek weapons and gadgets - Photos: Star Trek weapons and gadgets - Engage! Photos: Star Trek weapons and gadgets - Engage! 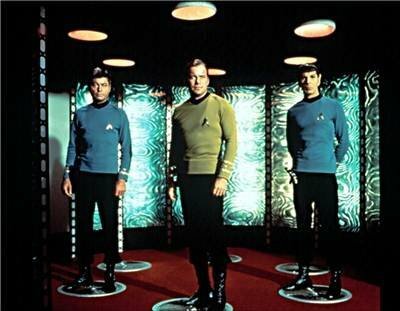 According to The Making of Star Trek, Star Trek creator Gene Roddenberry's original plan did not include transporters, instead calling for characters to land the starship itself. However, this would have required unfeasible and unaffordable sets and model filming, as well as episode running time spent while landing, taking off, etc. The next idea was the shuttlecraft; however when filming began, the full-sized shooting model was not ready. Transporters were devised as a less expensive alternative.